Magic Ball 2 - free download 3D Breakout game. Free download Magic Ball game. 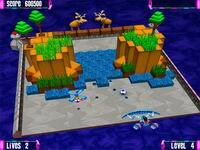 3D Arkanoid download. 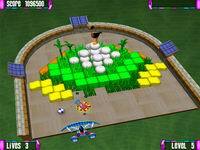 The popular Magic Ball series pays tribute to the arcade gameplay of Breakout, in which you remove all of the bricks on the screen using a ball, a paddle and select bonuses. The original Magic Ball was the first Breakout remake to feature 3D level design based on locations and objects found in the real world. Magic Ball 2 is an all-new sequel featuring additional bonuses, enhanced special effects and elaborate level design. One stage, for example, includes a pastoral setting that begins with sheep grazing in a field and a brook flowing past a small cottage; moments later, dozens of balls are bouncing around the screen, the house is crumbling and bonuses are raining toward the paddle! You will also stop a runaway train, demolish a burning building and topple a giant monster rampaging through city streets. Luckily, cannons and other weapons will give you the upper hand.